History of Present Illness: A 68 year old female patient presented in February of this year with a skin eruption of 10 weeks duration. It started with sores and bleeding of the lips,and then she developed lesions on her arms, upper chest, thighs and legs. Past Medical History: Cerebrovascular accident, Hypertension, Aortic Aneurysm. Medications: Lasix, Digoxin, Slow K, Isoptin, Warfarin, Capoten and Aldactone. The latter two medications had been started 3 months prior. Physical Examination: Crusted erosions were seen on the lips. The buccal mucosae were not involved. Annular erythematous lesions were seen on the chest, arms, thighs and legs. Laboratory Examinations: Histopathology of the right arm: (Reviewed by Dr. J.A. Posen of Lancet Labs-Johannesburg) The epidermis is largely necrotic and contains a subepidermal vesicle. Necrotic keratinocytes are present at the dermo-epidermal junction and throughout the epidermis. The upper dermis is edematous. Extravasated erythrocytes are present in the papillary dermis and upper dermis. 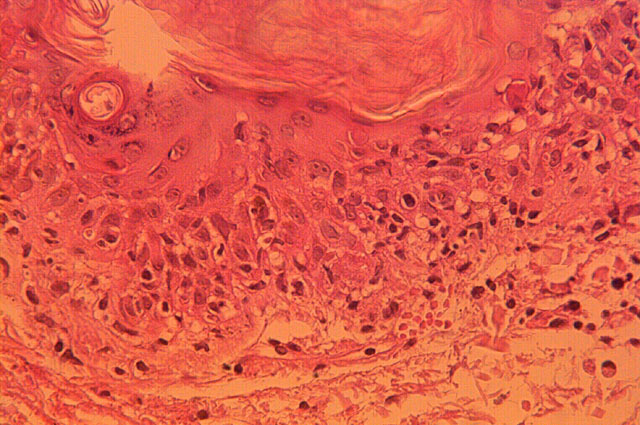 The histological features favor a diagnosis of erythema multiforme. Other relevant laboratory tests: ANF positive (speckled) 1:640. Anti-DNA (double stranded) 1:512 mid positive. SSB/La 6.065 high positive. A further relapse followed at the beginning of May. Targetoid and annular erythematous purpuric lesions were seen on the upper chest, arms, forearms, hands, thighs and legs. Perniotic lesions with ulceration were seen on her fingertips. Laboratory Examinations: ANF positive (speckled) 1:160. Anti-DNA (double stranded) 2.133 high positive. SSB/La 6.335 mid positive. Histology, June 1996: At a further relapse at the beginning of June skin biopsies were taken from the right arm, from lesional and normal skin for histopathology and immunofluorescence. Histology (Dr. J.A. Posen): There is focal surface parakeratosis. The epidermis in areas shows some degree of basal degeneration and the upper dermis is edematous with an increase in vascularity and a patchy mild lymphohistiocytic infiltrate. Some pigmentary incontinence is present. No epidermal necrosis or isolated necrotic cells are identified. The histologic features are in keeping with a diagnosis of lupus erythematosus. Immunofluorescence: (Dr. W. Grayson, The South African Institute for Medical Research). Direct and Indirect immunofluorescence of lesional and normal skin was essentially non-specific. Response to treatment: The patient has been treated with different combinations of oral and topical corticosteroids and oral and topical antibiotics. she has improved whenever on treatement but has had several relapses. However the intervals between relapses are becoming longer. EMAIL your diagnosis to the Internet Dermatology Society. If you mail in your case, please include the appropriate clinical and pathology slides to be scanned in. If you email your case, please include compressed jpeg or gif images to: RDrugge[AT_SIGN_HERE]telemedicine.org.